In life, love, war, and planetary colonization, even long-lasting friendships can end if one betrays the other's trust for his own gain. We studied the language of betrayal by observing players of Diplomacy, the game that ruins friendships. In this very popular game, players can form alliances and try to conquer the world together. These friend­ships sometimes survive, but often end in backstabbing. We found that there are subtle but consistent patterns in how people communicate when they are going to betray. Our computer-driven approach succeeded where the victims failed, picking up on these cues in spite of the betrayers' efforts to hide their nefarious intentions. Below is just an overview of what we found. For the complete details and results, check out our paper. Positive sentiment: the average number of positive sentences a player writes in a message. 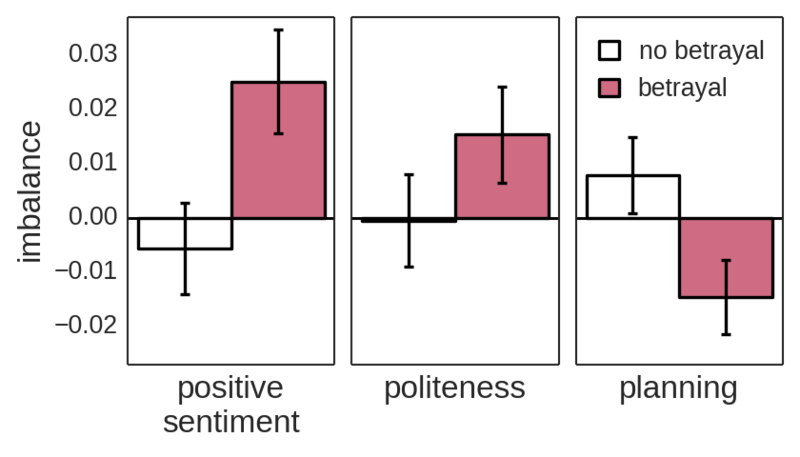 Politeness: how polite a player's requests are on average. Planning: how many words indicating planning for the future the person uses in an average message. Imbalance is the difference in a measurement between the two players. For these three measurements, friendships that last (white bars) are not significantly imbalanced. 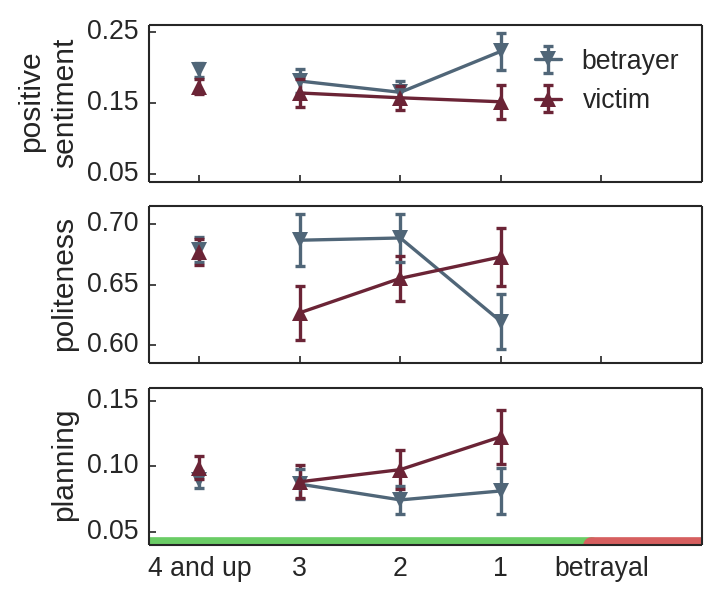 In alliances that end in betrayal (purple bars), the betrayer is much more positive and polite, while the victim plans more. But are friendships doomed from the start? How early do signs of betrayal begin to emerge? Betrayers suddenly become more positive, possibly attempting to hide their duplicity. Betrayers suddenly become less polite, after having kept up a façade of politeness, during which the victims were significantly less polite. 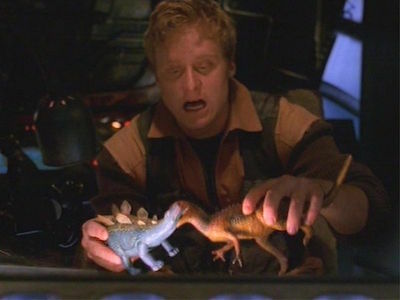 A reversal of imbalance occurs right before the betrayal. Victims plan more. Making a lot of plans can put pressure on the relationship and hasten betrayal, and, at the same time, if the betrayer's mind is made up, there is no point for him to plan. Interpersonal relations are fickle, with close friendships often dissolving into enmity. In this work, we explore linguistic cues that presage such transitions by studying dyadic interactions in an online strategy game where players form alliances and break those alliances through betrayal. We characterize friendships that are unlikely to last and examine temporal patterns that foretell betrayal. We reveal that subtle signs of imminent betrayal are encoded in the conversational patterns of the dyad, even if the victim is not aware of the relationship’s fate. In particu­lar, we find that lasting friendships exhibit a form of balance that manifests itself through language. In contrast, sudden changes in the balance of certain conversa­tional attributes—such as positive sentiment, politeness, or focus on future planning—signal impending betrayal. Download v1.0 ZIP (README, signature). This dataset contains a collection of 500 interaction sequences between allies in online Diplomacy games. If you find our dataset useful, would like to be informed of future updates, or have any suggestions on how we can improve it, we would love to hear from you. Diamondback: “Changes in language, tone could reveal impending betrayal” by Morgan Eichensehr. Huffington Post, “What You Should Know About Really Polite People” by Leigh Weingus. Ludology Podcast: “GameTek Classic 112 - Betrayal” by Geoff Engelstein. New York Magazine: “Here’s a Good Reason to Be Wary of Overly Polite People” and CNN: “Should you worry about people who are too polite?” by Melissa Dahl. Pacific Standard: “Detecting a Coming Betrayal” by Nathan Collins. Phys.org, from the Cornell Chronicle: “Language analysis predicts a coming betrayal” by Bill Steele. ScienceNews: “A few key signs betray betrayal” by Rachel Ehrenberg. The Wall Street Journal: “When Diplomacy Leads to Betrayal” by Christopher Chabris.